Please click here to report broken links or other site problems. Thank you! The 5°, 10°, 19°, 26° and 50° fixed focus Phoenix LED Profile Spots are state of the art luminaires in function, style, and efficiency. These Profile Spots have been designed and engineered with a number of innovative details and features enhancing versatilty and efficiency without sacrificing performance. 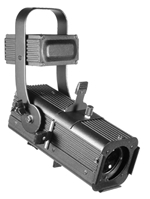 The Phoenix LED is available in multiple LED choices: 250 watt RGBA, RGBW, 3000k and 5600k versions. Fully locking shutters and a 360° rotating barrel help keep the artistic part of your fixture's focus intact and easy to attain, and with virtually no light leak from the fixture itself you wont have to worry about any extra light illuminating unwanted parts of the ceiling. The aesthetic appearance and ergonomically designed function controls only add to the appeal. 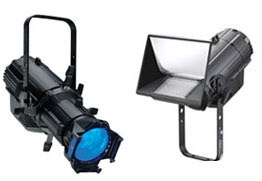 All of these new and innovative options are what makes the Phoenix LED Profile Spotsideal for theatres, Special Events, television studios, or wherever superior, energy efficient lighting performances are required. 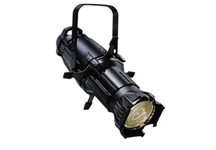 Ultra-efficient for more lumens per watt, the Source 4 is rated for up to 750 watt. The rotating barrel makes aligning projected images a snap. Interchangeable lens tubes make your inventory more flexible. Color frame and C-clamp included. Order lamp, connector, and additional accessories separately by scrolling down.For full kits please scroll up. Shipment subject to stock at time of order. Light quality is the driving force behind ETC’s LED product development. Countless hours have gone into creating tools worthy of the most professional applications, and the Source Four LED Series 2™ luminaire is the result of that dedication. With the brightest output and the boldest rendering of the colors you use most, the Source Four LED Series 2 introduces a whole new level of LED lighting that can be used anywhere. ETC’s x7 Color System™ changes the way you see LED lighting. Instead of limiting you to just three LED colors, the x7 Color System combines a balanced recipe of up to seven colors to create evocative color mixes. The Source Four LED Series 2 Lustr® array takes the idea even further, with the addition of a lime-green LED emitter. Lime green increases the luminaire’s lumen output in open white and lighter tints to make them brighter and livelier, better matching the color of a conventional Source Four® fixture. The lime also enriches color-rendering by better marrying the red and blue ends of the color spectrum, for truer-to-life light that fills in the gaps that ordinary LEDs leave behind. Also added more red to the x7 Color System in the Source Four LED Series 2 Lustr array. Working in unison with the lime-green emitter, the extra red means the luminaire can produce ambers, straws and pinks up to three hundred percent as bright as those from the original Source Four LED™. The deeper, richer color from the Source Four LED Series 2 will evoke the strongest audience reaction to your sunset, moonlight and dramatic scenes. 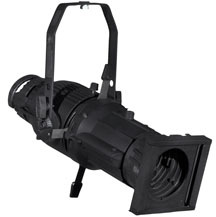 Includes the Source Four engine with the shutter barrel assembly, Edison to PowerCon power input cord, c-clamp, soft focus diffuser and an A size pattern holder. Source Four LED Daylight luminaires produce beautiful light that mimics natural daylight. They provide the same functionality as other fixtures in the Source Four family, with a low-power, high-efficiency output of cool white light. 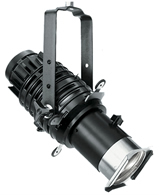 Source Four LED Tungsten fixtures give you the look of tungsten from a highly efficient, low-power LED source. With the soul of a Source Four, the Source Four LED Tungsten luminaires create pure, warm-white light. 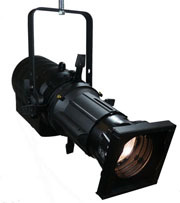 A small unit good for intimate theatres, night clubs, or churches. Four shutters, safety cable & color frame included. Medium 2-pin lamp socket is standard. 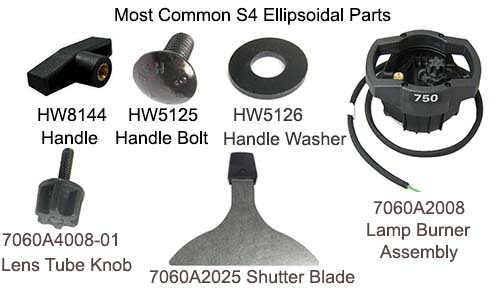 Lamp, connector and clamp ordered separately. The Micro Ellipse is a lightweight framing spotlight with a 2" optical system which produces a narrow to medium beam up to 15". Unit has a built in transformer and uses MR16 12 volt lamps. Comes with framing shutters, pattern slot, color frame and safety cable. .
Order clamp, pattern holder and lamp separately. Uses E size, 37.5mm pattern. Goto Clamp page for selection. Available in black & white and a variety of anodized colors with optional dichroic color filters for architectural applications at additional costs.